This adjustable thermostat and hygrostat, ETF300, with either a normally open (NO) or normally closed (NC) contact, manages both relative humidity and temperature. It is used to control installed devices, such as a fan heater, to turn on or off at the required humidity and temperature levels, that are set by the user. The result is elimination of water condensation at a reduced operational cost. Electronic hygrostat-thermostat monitors the relative humidity and the temperature independently of each other, and it manages heaters and filter fans to prevent condensation and corrosion inside the enclosure. Mounting clip for 35 mm DIN rail (EN 60715). 0 °C to +60 °C, and 40 to 90% R.H.
240 V AC, 8(3) A. 120 V AC, 8(3) A. 24 V DC, 4 A. Value in brackets for inductive load. -20 °C to +60 °C. Pole terminal for 2.5 mm². Adjustable thermostat and hygrostat, with a normally open (NO) and normally closed (NC) contact. The thermostat and hygrostat monitors both relative humidity and temperature and can therefore, control a single heater, increasing the enclosures temperature in order to reduce the relative humidity. Customers are able to adjust the relative humidity and temperature inside the enclosure, in order to create a suitable environment for the installed components. The normally open contact will therefore close (turning on the heater) when either, the temperature drops below the set value, or when the relative humidity rises above the set value, this could happen at the same time. The installed devices, such as fan heaters, automatically turn on or off when they are required, which reduces the operational cost of the control panel. Customers can adjust the required humidity and temperature, which means it can be installed in any enclosure, and is not dependant on the other installed components or equipment. 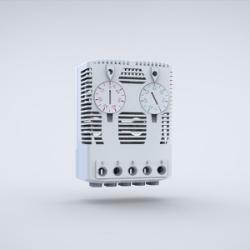 The reliable thermostat and hygrostat manages both the relative humidity and temperature within the enclosure, preventing water condensation from occurring.